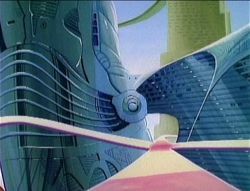 Robo Land is a large, futuristic city made up of tall, metal buildings and elevated walkways, located somewhere near the Mushroom Kingdom. Robots appear to be the main inhabitants of this land, although it can be assumed that there are humans living there as well, as at least one resident, Dr. Nerdnick, is a human himself. On the elevated walkways of Robo Land are tunnels leading down to the lower levels and into the sewers. Dr. Nerdnick's workshop is also located somewhere within Robo Land. At least one junkyard is also located somewhere in the city. Dr. Nerdnick was an established inventor living in Robo Land, where he worked on his inventions alongside his aide, Bunsen. At some point, King Koopa found Dr. Nerdnick and convinced him to build him a Robo Suit for his very own. Not knowing much about King Koopa, Dr. Nerdnick went ahead and built the suit for him. With his new Robo Suit, King Koopa became Robo Koopa and began to terrorize Robo Land, destroying entire buildings at his leisure. Bunsen contacted Princess Toadstool about Robo Koopa, and asked for her to come to the rescue with Mario, Luigi and Toad. The group arrived, and was nearly defeated by Robo Koopa soon after, but Bunsen came to their rescue by reprogramming Robo Koopa's Robo Suit. Although this resulted in the destruction of a building, Robo Koopa was forced to retreat, while Bunsen could lead Mario's group to Dr. Nerdnick's workshop, where he was being held prisoner. Bunsen managed to free Dr. Nerdnick while Mario's group distracted the robot guards, but Robo Koopa appeared and ultimately captured Princess Toadstool and Toad. Robo Koopa then chased the others through Robo Land, and proceeded to crush them with a transformer. Mario and Luigi stalled the transformer with water from a fire hydrant, and escaped to a junk yard, while Robo Koopa got electrocuted. At the junkyard, Dr. Nerdnick assembled the Plumbinator for Mario and Luigi, so that the two would stand a chance against Robo Koopa during their next encounter. Shortly after the Plumbinator was built, Robo Koopa approached it, and was challenged to a fight. Robo Koopa fought the Plumbinator, and after destroying a few more buildings, he succeeded in destroying the Plumbinator itself by knocking off a rooftop and onto a walkway. Soon Robo Koopa had Mario, Dr. Nerdnick and Bunsen cornered. However, Dr. Nerdnick tricked Robo Koopa into pushing his suit's ejector seat button, which sent King Koopa flying out of the suit and into the sky. Sometime after King Koopa's defeat in Robo Land, Mario, Luigi, Princess Toadstool and Toad returned to the Mushroom Kingdom, where they lived in peace until the events of Super Mario Bros. 3. This page was last edited on February 13, 2018, at 22:48.